Here is the Game log continues to be updated here. The most current updates will always be here, but this is an archive of the early season updates. 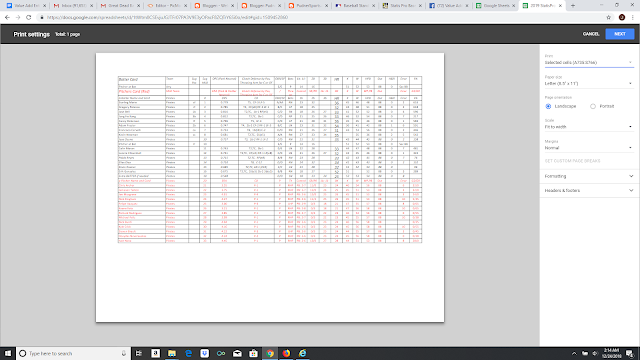 The following standings result from playing the free Statis-Pro baseball game using these 2019 projected player cards for 1000+ potential MLB sorted by current rosters. Updates on the previous games through January 17, 2019 and reviews appear here. Mets 7-5 0 - Cespedes stars to sweep Nats, but will he really return in key life in 2019? Phillies 6-6 2 Finally made them play Cubs after trying to wait for Harper's decision. Brewers 6-6 3 - Will dominant relievers be enough to repeat? Reds 5-7 4 - Puig, Wood and Kemp from Dodgers great, but can they get any relief pitching? Game log will be kept on this google sheet and periodically pasted below. We pay each game counts as 3, with the winner getting 2 wins and the loser 1 win UNLESS winning team led by at least 5 runs after 8 innings without using their closer. In that case winning teams "sweeps" the series 3-0. We finally tired of waiting for Bryce Harper's decision, so had the Phillies and Cubs play without him and the Cubs won the series. A big acquisition that may pay off is Eric Hosner, who took the Brewers to the top mark in our Statis-Pro season last year and has scorched the Braves and Dodgers in our first two offseason series. SD Lamet 9 LAD Ferguson 2 Sweep 1/5/2019 Dodgers best player cards, but like the 1927 Yanks proved vulnerable vs a lefty starter and 5 lefty relievers, and w/ rookie replacing traded Wood, SD's Hosmer's onslaught continued off rookie Ferguson in 5-0 1st inning of 9-2 Sweep. 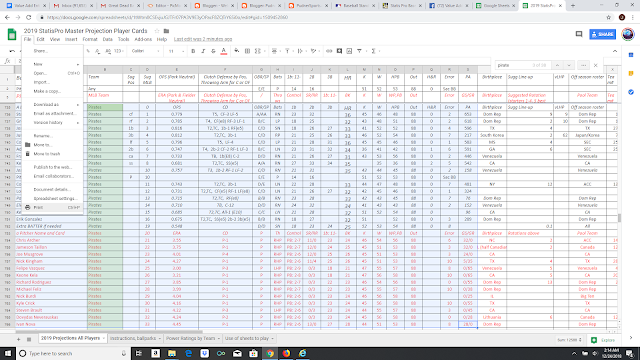 Game log will be kept on this google sheet and periodically pasted below. We pay each game counts as 3, with the winner getting 2 wins and the loser 1 win UNLESS winning team led by at least 5 runs after 8 innings without using their closer. In that case winning teams "sweeps" the series 3-0. 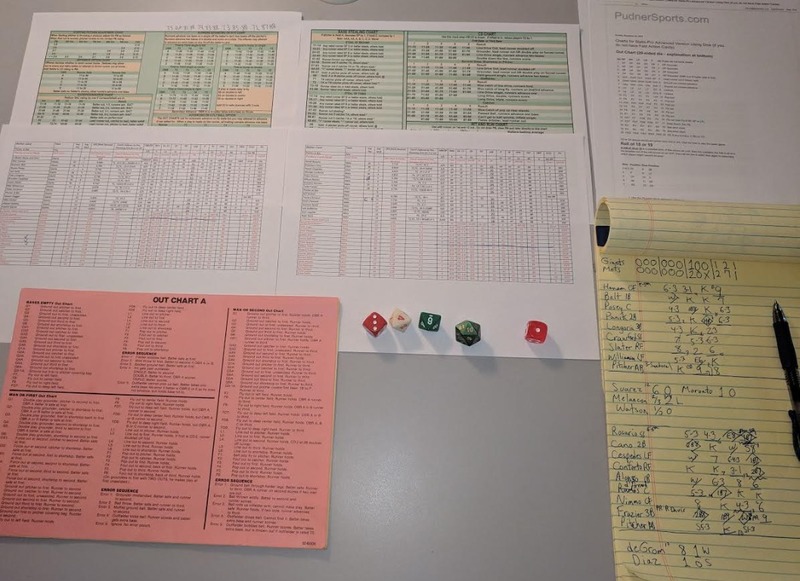 To try it out Print projected player sheets for all 2019 players and free dice version of game (just add dice in photo below) and print Out Chart. If you are a 1st time player but then buy the full player cards in line for current or historic teams. On the sheets you can sort teams by nation or MLB team, for example the Pirates No. 1 and No. 2 hitters in the game are Dominicans Starling Marte and Greg Polanco who just scored a combined 7 runs to beat the Cardinals in our first MLB games. Prior to that, they led the Dominican Republic to a 21-9 record to win the regular season and playoff over 2nd place Venezuela. The set up looks like the next photo, and you can order here if you want to purchase nice PDF player cards and games.We created the dice version and out chart so you could 1) use it as a free trial, 2) use all the other great teams and charts here even if you have trouble getting Fast Action Cards, and 3) to use as I do as a travel version without having to pack the whole game on trips. 3, hit print but choose to only print those cells you have selected so you get one nice sheet for all of the team's batters (which are in black) then pitchers (which are in red). Latest: AJ Pollock reached three of four times in his Dodgers debut and made a clutch diving catch to end the 6th and keep Clayton Kershaw in a 2-2 tie en route to a 3-2 win. Bellinger made a clutch diving catch in centerfield the batter before, and in the 8th Turner made a diving catch at third base to end what had been a bases load, no outs rally. Bellinger then led off the bottom of the eighth with a game winning homer, and Jensen got the save in the top of the 9th to finally best the Diamondbacks, whose strong pitching put them in first after two series. Dodgers won the 2nd game 1-0. After the first 12 games for each team Sonny Gray was traded to the Reds to give them a very nice starting rotation as covered here. The biggest signings since then (Jan 22) were AJ Pollock going to the Dodgers (.764 OPS and excellent CD4 in the outfield) and Nick Markakis who projects only a few points behind with a .757 OPS and one of the few fielders better than Pollock with a rare Clutch Defense 5 in RF to make the Braves even stronger. The Angels tried to help their terrible pen with Cody Allen, but we only project him as a PB2-7 (3.92 ERA as a reliever decent but not the old Cody Allen). Also, the Rangers signed Asdrubal Cabrera with a decent .756 projected OPS but no speed and below average fielding. All Statis-Pro cards are sorted by team here. Only two great Statis-Pro pitching cards remain among free agents with ace reliever Craig Kimbrel (projected park neutral 2.72 ERA for PB2-9) and starter Dallas Keuchel (3.76 ERA for PB2-7). Beyond the two superstars of Bryce Harper (.923 projected park neutral OPS trails only Trout) and Manny Machado (.878 and elite clutch defense 3b-5 clutch defense) there are solid sluggers Mike Moutstakas .789 and cf-4, Evan Gattis .753 and Marwin Gonzalez .748. Two light-hitting but awesome middle infielders up the middle are Jose Iglesias (weak .677 but SS-4) and Josh Harrison (.689 but 2b-4). In 2018, we played the imbalanced AL and the Red Sox, Yankees, Astros and Indians dominated to all finish between 36-24 and 38-32. However, the NL is incredibly balanced so every new acquisition gives another team a chance to emerge. In order to list out all teams as they look with their rosters today, we set up 30 interleague 2-game series and will list match-ups and result of our two sample games in each match-up below.